With an ensemble cast comprising of Anil Kapoor, Farhan Akhtar, Ranveer Singh, Priyanka Chopra, Shefali Shah and Anushka Sharma, it’s difficult not to be wetting one's pants in anticipation for Zoya Akhtar’s Dil Dhadakne Do. 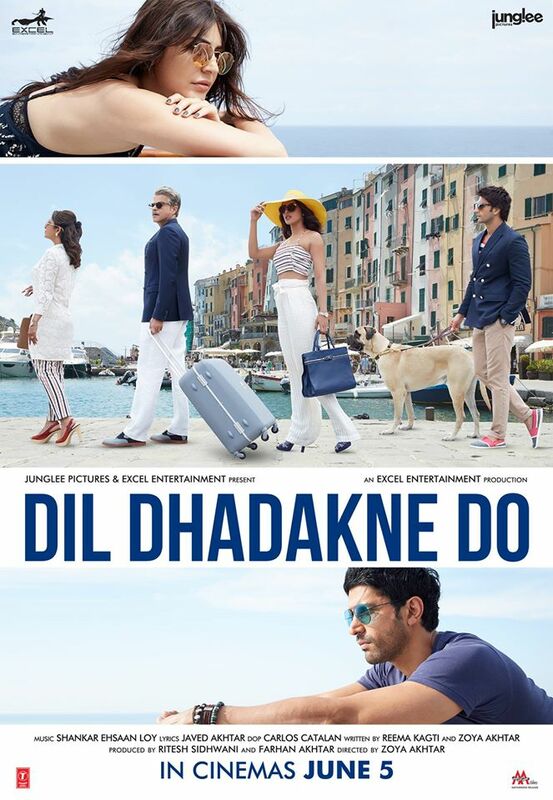 Set predominantly atop a Mediterranean cruise ship, Dil Dhadakne Do tells the story of a dysfunctional Punjabi family, the Mehras (Anil Kapoor, Shefali Shah, Ranveer Singh and Priyanka Chopra), and how that journey of a lifetime alters the course of their lives forever. The film has been in the news ever since it was set to roll, what with it initially said to feature a whopper cast of Anil Kapoor, Madhuri Dixit, Hrithik Roshan, Ranbir Kapoor, Kareena Kapoor and Katrina Kaif, and director Zoya Akhtar supposedly being in a fix when she failed to get them to sign on the dotted line. Word has it though, that she was equally confident and happy with whom she managed to ultimately replace them with and get on board with the project in the end, and to be honest I think she kinda nailed it with the casting too, for its unpredictability if nothing else. Not much was known about the film prior to its trailer, but there are quite a few nuggets of the plot that seem to have now emerged after watching it. That Ranveer and Priyanka were playing siblings was a known fact, but what becomes apparent here is that their parents are keen to get Ranveer married off, and for Priyanka to rethink her divorce purely so that that they can save face, given their high profile reputation. Farhan and Anushka seem to be playing the saner characters from the motley crew and it seems Anushka plays Ranveer’s existing love interest while Farhan plays Priyanka’s ex who she ditches for Rahul Bose's character. Plot details aside, Zoya has unsurprisingly, managed to draw what seems like some terrific performances from her cast with each of them playing parts that neither of them seem to have played before, and with each of them successfully bouncing off each other in creating a classy, laugh out loud, coming of age comedy that seems set to warm the cockles of our hearts this summer. The trailer is peppered with some giggle inducing moments, notable among them being Shefali-Anil’s deadpan camaraderie, Ranveer’s frustrations at being paired off, and equally his incredibly convincing sibling pair off with Priyanka with whom he was romantically cast with in Gunday. Priyanka and Farhan make for a striking on screen pair and Ranveer-Anushka seem to have successfully re-ignited sparks on screen from an era gone by. The film’s frames are luminously lit with pastel hues which are in line with its theme, and just like Zoya’s previous films, Shankar Ehsaan Loy may have come up with a winning soundtrack, but the jury’s out on that one until we actually get to hear it. Ably supported by Zarina Wahab and Rahul Bose, the madcap Mehras, Sunny Gill and Farah Ali are all set to entice us with their antics on 5 June 2015. All I can say is, if the film’s half as good as the trailer then Zoya seems all set to reprise the success from her 2011 smash Zindagi Na Milegi Dobara. Is your heart beating for Dil Dhadakne Do? Let us know below. "The thing with the industry is that if you're not good looking, you're classified an actor...!" This and other gems came out of fashionista Sonam Kapoor's mouth on this week's Koffee With Karan! Find out what we thought of the show right here! Firebrand Kajol with cousin Ayan Mukerji on Karan's couch made for what was undoubtedly one of the season's most entertaining shows. Find out what we thought of it right here! "Mum always said never trust a man with no chest hair..." — a quotable quote no doubt, but this week's episode of Koffee With Karan featuring Abhishek and Farah, left us a bit cold and disappointed. Our take on this week's episode featuring a candid Anurag Kashyap, and latest surgical 'enhancement' victim, Anushka Sharma. This week's episode featuring Sonakshi Sinha and Shahid Kapoor, proved to be surprisingly fun. Find out what we thought of the show right here! Find out what we thought of the controversial Mahesh Bhatt and his protege Emraan Hashmi's candour, when they appeared on Koffee WIth Karan Season 4! Farhan Akhtar and Vidya Balan appeared on Karan Johar's infamous couch over the weekend – find out what we thought of the show right here!